Watch the video below to find out what else Doctor Who‘s Arthur Darvill (Rory) has been up to. The tales of Max Carrados lie squarely in the classic English detective tradition, told in plain though polished prose. Max is an omniscient blind amateur detective with a wry sense of humour. Arthur Darvill reads five of his brings five of his finest adventures to life. Max Carrados is available to download from SpokenWorld Audio now. Max Carrados featured in a series of mystery books that first appeared in 1914. Carrados featured alongside Sherlock Holmes in the “Strand” magazine in which they both had top billing. The character often boasted how being blind meant his other senses were heightened. The author Ernest Bramah excelled in his detailed writing and uncovering of clues. The beneficiary of a large inheritance from an American relative, Carrados is foremost a gentleman who undertakes sleuthing only as an avocation. 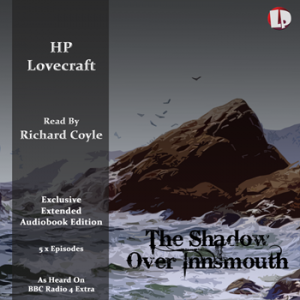 HP Lovecraft, the American master of horror, has one of his most twisted tales adapted into a brand new audiobook. Previously heard abridged on BBC Radio 4 Extra, the audiobook version can be found in it’s full length glory at Spokenworld Audio. This new adaptation is read by British actor Richard Coyle, possibly best know as Jeff from Coupling, which is a crime as his genre credits include BBC’s STRANGE, Terry Pratchett’s Going Postal, Prince of Persia: Sands of Time and the FABLE video game series. As usual Spokenworld Audio have taken care to make this full length version available through their website, and offer download in 192Kbps MP3, 256Kbps MP3 and 320Kbps MP3 formats (at the same price) – so you can enjoy the audio book as best suits you. The perfect HP Lovecraft title to follow on from 2010’s “At The Mountains Of Madness”, and the only HPL title not to appear in a periodical! Perfect also because it is split in to 5 distinct chapters…ripe for abridgement in to five half hour episodes! ?The Shadow Over Innsmouth? tells the first-person story of a young historian, Robert Olmstead, who, while investigating his family genealogy in New England, is intrigued to learn about a hated and mysterious fishing-town called Innsmouth. When he visits he finds the place to be run-down and near-deserted, with a cult-like religion and a strange, degenerate population. His investigation soon turns in to a race to escape the town and the the evil creatures he sees emerging from the sea. ?The Shadow Over Innsmouth? was written by HP Lovecraft in 1931 and is the only one of his works of fiction not to have initially been published as part of a periodical. It continues HPL’s Cthulhu Mythos, featuring townspeople worshipping the elder sea god Dagon and mentioning the mysterious Shoggoth creature of his other works. Howard Phillips “H. P.” Lovecraft (August 20, 1890 ? March 15, 1937) was an American author of horror, fantasy and science fiction, especially the sub-genre known as weird fiction. As early as the 1940s, Lovecraft had developed a cult following for his Cthulhu Mythos, a series of loosely interconnected fiction featuring a pantheon of humanity-nullifying entities, as well as the Necronomicon, a fictional grimoire of magical rites and forbidden lore. His works were deeply pessimistic and cynical. Although Lovecraft’s readership was limited during his life, his reputation has grown and he is now regarded as one of the most influential horror writers of the 20th Century. Stephen King called him ?the twentieth century’s greatest practitioner of the classic horror tale.? This 2011 adaptation comprises 5 episodes, originally aired on BBC Radio 4 Extra, once again read by the superb RICHARD COYLE and featuring music by acclaimed composer JON NICHOLLS. The series is offered here in exclusive EXTENDED EDITIONS. You will find an additional 30 mins of mystery-filled audio within these five episodes! 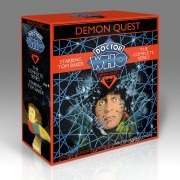 Doctor Who fans can immerse themselves in the world of the time traveller and his foes with the release of the complete boxed set of Doctor Who: Demon Quest. With the TARDIS not working properly, the Doctor, his housekeeper and Mike Yates embark on a journey through time and across continents where they must face the elusive, demonic being who keeps luring them on in their quest. It soon becomes clear that a trap has been laid for the Doctor – can he triumph yet again? 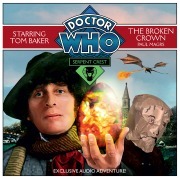 For those who have been eagerly awaiting the next instalment of Doctor Who: Serpent Crest, the wait is over with the release of Part 2: The Broken Crown. This brand new multi-voice adventure for the 4th Doctor, played by Tom Baker, features characters from the classic Doctor Who TV series, written and produced for audio with specially composed music and sound design. With both titles written by the acclaimed Paul Magrs, the excitement mounts to keep us on the edge of our seats. For an even more chilling experience there are two horror titles for lovers of the ghoulish. 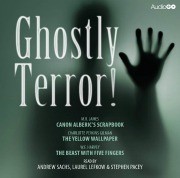 Ghostly Terror is a terrifying collection of classic ghost stories from masters of the genre, by various authors and readers. Amongst the stories are The Beast With Five Fingers by WF Harvey, read by Stephen Pacey, and Canon Alberic’s Scrapbook by MR James, read by Andrew Sachs. 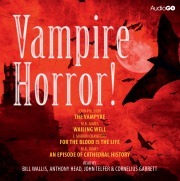 Vampire Horror, a blood- curdling collection of short stories with a vampire theme, from classic authors including MR James and Arthur Conan Doyle, will appeal to sci-fi and fantasy fans as well as devotees of classic literature. All titles will be available through AudioGo for download or CD purchase through Amazon or good book shops. The complete first series of this seminal BBC Radio sci-fi drama epic ? plus extra bonus material. Charles Chilton?s classic radio sci-fi series ?Journey into Space? 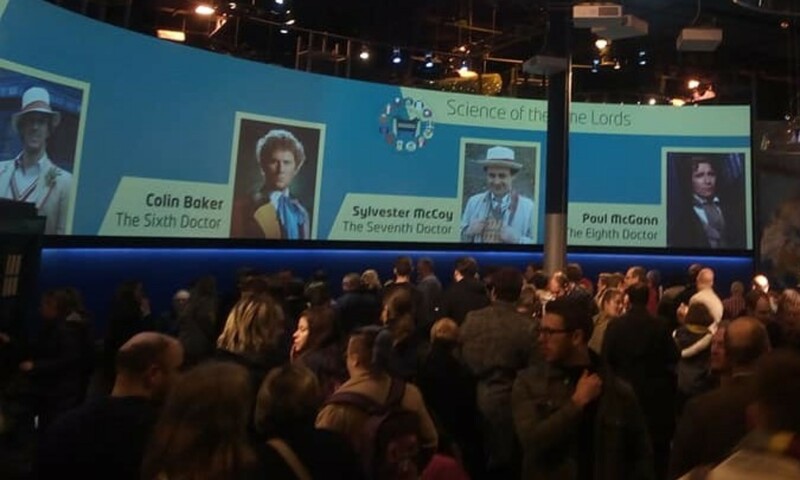 thrilled listeners between 1953 and 1958, attracting almost eight million people to its gripping tale of the far future and the thrills of interstellar travel ? the last radio programme in the UK to attract a bigger evening audience than television. The original first series, ?Journey to the Moon?, was lost, but thirteen episodes were re-recorded in 1958 under the title ?Operation Luna?, starring Andrew Faulds as Jet Morgan, Alfie Bass as Lemmy, Guy Kingsley Poynter as Doc, David Williams as Mitch and also featuring David Jacobs. All thirteen are included here, as well as the sole surviving extract from ?Journey to the Moon? and a special half-hour documentary ?Journey into Space… Again?, featuring clips from the series and interviews with Charles Chilton and members of the cast. Also included on the CD version is a PDF file of a comprehensive 16-page booklet detailing the history of the series, with cast lists and episode guides. 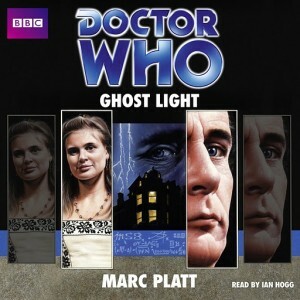 A gloomy, decaying mansion, a mysterious fire, and a reclusive 19th century naturalist with blasphemous theories are the sinister elements to be found in Doctor Who: Ghost Light, an unabridged reading of Marc Platt’s classic Doctor Who adventure. Who – or what – is Josiah Smith? What terrible secret does his house conceal? And, as the Doctor and Ace venture from the Tardis to explore the mansion, why does Ace find everything so frighteningly familiar? 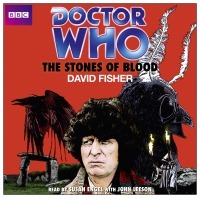 This thrilling tale of mystery and danger read by Ian Hogg, who played the naturalist Josiah Smith in the original Doctor Who TV serial, is accompanied by atmospheric music and sound effects to enhance the whole chilling experience. 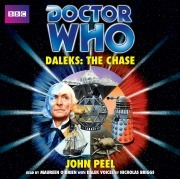 Daleks: The Chase, is a thrilling novelisation of a classic Doctor Who adventure, written by John Peel (based on TV scripts by Terry Nation) and read by Maureen O’Brien, with Dalek voices by Nicholas Briggs. Through a Space-Time Visualiser the Doctor and his companions are horrified to see an execution squad of Daleks about to leave Skaro on a mission to find the TARDIS and exterminate the time travellers. Eluding the Daleks on the barren planet Aridius the Doctor and his friends escape in the TARDIS. But this is only the beginning of an epic journey. Duration: 4 hours 30 mins approx. 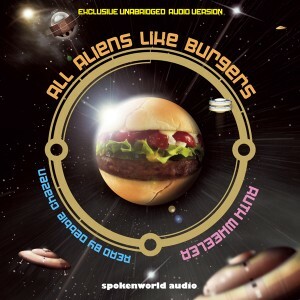 Available from www.audiogo.co.uk and all good audio retailers. 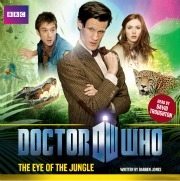 It’s open season on the Doctor in July, with the release of brand new original adventure The Eye of the Jungle. Written specially for AudioGO by Darren Jones, it is read by David Troughton and takes place in the Amazon rainforest in 1827. The Doctor, Amy and Rory arrive in the jungle near a hurriedly abandoned campsite, where they are surrounded by hungry black caiman – huge lizards. Only the arrival of a man with a rifle sees off the giant beasts. Oliver Blazington has come to the forest to bag big game, and his companion Garrett is a naturalist, collecting exotic creatures for London Zoo. But the Doctor soon discovers that another very different hunter is stalking the Amazon. Animals and people have been disappearing without trace, and local villagers speak darkly of ‘The Eye of the Jungle’. 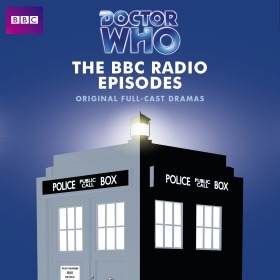 In May 2011 AudioGO (formerly BBC Audiobooks) release a brand new audio novelisation of a 1978 Doctor Who TV adventure. Written specially for AudioGO by the serial’s original author, David Fisher, The Stones of Blood stars the Fourth Doctor (as played by Tom Baker) with companions Romana and K9. 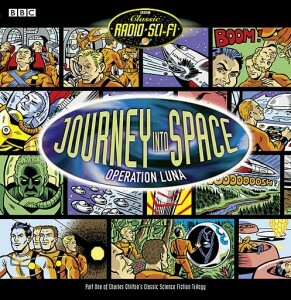 The audiobook features specially-composed music and sound design, and is read by Susan Engel, who played Vivien Fay in the 1978 story, with John Leeson as the voice of K9. May 2011 sees the release of The Hounds of Artemis, the new Doctor Who audio book from AudioGO.? The Hounds of Artemis was the subject of a Daily Telegraph covermount promotion in February 2011, but this trade edition now has the benefit of full music and sound design. This May, AudioGO are thrilled to be releasing an original Doctor Who adventure following the Eleventh Doctor and Amy Pond. 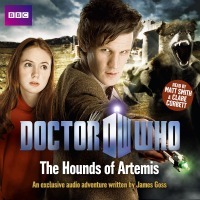 Written specially for audio by James Goss, The Hounds of Artemis is read by Matt Smith as the Doctor and Clare Corbett as Helen Stapleton, and features original music and sound design. Young, polite and intelligent Tom Bowler has barely ever ventured out of the small English town where he grew up. So when he applies for a job in a fast food restaurant at a ?local? service station during his gap year he is rather surprised to discover that the vacancy is in fact based on Truxxe, a planetoid stationed between local galaxies Triangulum and Andromeda. Hes surprised further still to find himself becoming friends with a purple alien and that he has strange feelings for his android supervisor, Miss Lola. Tom soon discovers that Truxxe has many hidden secrets – just what makes it so special? And why is its terrain so rich and varied that it can be used for fuelling such a diverse variety of intergalactic spacecraft? What are the Glorbian space pirate brothers Schlomm and Hannond plotting? And just what is it that they put in those burgers? March 2011 sees the? 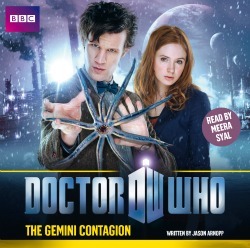 release of brand new original 11th Doctor, Doctor Who, adventure The Gemini Contagion. Written specially for AudioGO (BBC Audiobooks) by Jason Arnopp, it is read by Meera Syal, who played Nasreen Chaudhry in the BBC TV episodes The Hungry Earth and Cold Blood. The Gemini Contagion begins on the ice-planet Vinsk, in the year 2112. The all-new anti-viral handwash, Gemini, has been laced with Meme-Spawn: a sentient micro-organism which makes the user fluent in every language in the universe. However, manufacturer Zalnex made one crucial mistake. They didn’t test Gemini on humans, who are seized by the violent urge to communicate but speak every language all at once with a manic, garbled shriek and pass on the virus by touch. The Doctor and Amy arrive on an Earth-bound cargo-ship loaded with Gemini, where a human crew are succumbing to the virus which has nasty second and third phases in store. When the Doctor and Amy are separated, they both know that it’s only a matter of time before Amy is infected. With the ship locked on course, and no way of curing the sufferers, the Doctor is faced with a terrible decision: does he save Amy, or Earth?